A proposed agreement has been reached between the Communication Workers Union and Royal Mail on pay, pensions and other issues. The deal lifts the threat of industrial action over Christmas, Royal Mail said. A joint statement issued in October, when the union called off a strike, said an agreement would include an improved pay and pensions deal. 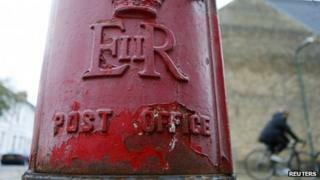 Royal Mail was privatised earlier this year and employees were given shares in the company. The privatisation was opposed by the union and the share offer was seen as an attempt to smooth labour relations. The CWU said in a statement the agreement would now be considered by its executive and then its members. "Details of the proposed agreement will be made available following the conclusion of the meeting of the union's postal executive," it added. Both sides agreed that a recent ballot for industrial action "remained valid". But Royal Mail added in a statement to the stock market: "The CWU has confirmed that there will be no disruption through industrial action during the ratification process of the proposed agreement, including the whole of the Christmas trading period. "An announcement on the content of the proposed agreement will be made when it is ratified by the union's executive committee. "The proposed agreement is also subject to approval by the Royal Mail plc board." The company said it had come to an agreement with the union in principle over pay, legal protections, industrial stability and pensions.